A shy 16-year-old girl named Rhiannon (Angourie Rice) finds herself attracted to a mysterious soul named "A" who wakes up every single day in a different body - sometimes male, sometimes female, sometimes white, sometimes another color, but always the same age. Feeling a connection, Rhiannon and A try to find each other every day, but Rhiannon never knows what to expect or what body to look for. As they fall in love, the realities of loving someone who is a different person every 24 hours takes a toll. Based on the New York Times bestselling young adult novel Every Day by David Levithan. 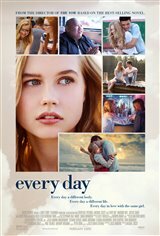 Every Day Movie Clip - "Make It Work"
Every Day Featurette - "Every Day People"
Every Day Featurette - "An A By Any Other Name"